If starting a website seems like some strange new language to you, don't worry. It's not as difficult to get started as it may seem at first. Simply follow the easy steps below, and you'll be a webmaster in no time! If you've already registered your domain name, skip to step #2. AllWebCo has 5 packages to select from starting at $9.95. View packages. Transfer any existing site to our servers from another host or create a new site. Transfer your files in the control panel, with FTP software or using Windows Explorer. The first decision is which type of domain name you want to use for your site. If your site is used for strictly personal use (pictures of family reunions, web journal, etc...) then you may choose to use what's called a "third level" domain name, such as www.whatever.allwebco.com It (like any other domain name we host) will work with, or without the www in the address. The only advantage of using a third level domain name, is that you don't have to pay anyone for the registration of that type of name. If you choose to use a third level domain name, when you order your package and you're asked by the order form, you'll need to choose "Pre-registered by AllWebCo" from the domain name choices. If you're doing anything even remotely commercial, you will find that many visitors to your site will not order from you if you're using a third level domain name. This is because it appears to be a small personal site, rather than a company sizable enough to be capable of, and responsible for, a satisfying internet business transaction. While there are many schools of thought on what makes one domain name better than another, the most important thing to keep in mind is that the name should be easy to remember, and easy to spell. The name won't help you if people can't remember it, or can't get to it due to spelling errors. Make it short. It's easier to remember, and type in if it's a short name. Do your best to make sure it's not someone else's corporate name, trade-mark, etc... You don't want dispute headaches like that after you've spent the time and energy to make your site popular, and people know where to find you. Many people register multiple, descriptive names in an effort to rank higher with related keywords in the search engines, and point them all to the same site. This can be done after setting up your original account, by going to the "adding features to your account" section of our site, where you can order "parked" domains for a one time charge. Many new domain name extensions are now available, but ".com" remains the most popular by far. If a visitor of your site is trying to remember your domain name later, you want it to be ".com" but we can host your site using ANY domain name extension in existance. You can click here to check the availability of, and/or register your desired domain name. If you need more info on transferring the domain name to our registrar, or help starting it correctly point to your new website from your current registrar, see "help for pointing your domain name"
Whether you're looking to have a simple electronic business card, a full fledged internet ecommerce business, or anything in-between, our Web Hosting Packages are designed to suit your needs. Review the features of each package, and choose the one that best suits your needs for your particular site's functionality and concept. You can get an over-view of all of the packages by clicking here. If you have any questions, please feel free to click here and ask! If you're planning to sell anything with your site, and you're not an experienced web designer, you will probably want to either use website templates, use pre-made sites or hire a designer or design service to build your site. If your site is not professional looking enough to compete with the look of your competitors' sites, then you could lose a lot of business. You can get more information on AllWebCo's design department by clicking here. We also have on-line quotes for custom design work. The best way to start designing your site without design help, is to plan it all out (on paper if need be) to get an idea of what pages you want, what you want them to say, and what you want them to look like. When you're ready to start construction of your web pages, you'll need to decide which program you'd like to use to build them. All hosting plans include access to the Site Manager in your control panel. There are also many third-party programs you can use to help you build your web pages. For beginners, and those who do not wish to learn HTML (Hyper Text Markup Language - the basic language used to create web pages) you may want to find a WYSIWYG (What You See Is What You Get) type editor. These types of editors usually let you type your text and drop images into directly into a web page on your computer, change colors, etc... and it will write the html for you. More experienced webmasters who are familiar with HTML can use any text editor, such as Windows Notepad. Whatever you decide to use may or may not have the ability to upload your new pages to our servers. If it doesn't include Telnet or FTP (File Transfer Protocol) capabilities, you can always use a different program to FTP (upload) the pages from your computer to our servers. See step four for more info on uploading your files. 4. Upload your web pages to your new server space. It has been said that you can do anything you want to a website using telnet. It has also been said that you can travel all over the globe using only a life jacket and a pogo stick, but that doesn't mean it's the best way to get where you want to go. If you're not already familiar with telnet, it's probably best to avoid it for now and come back to it if the need arises. For now, use FTP or your control panel to upload files to your site. If you are familiar with telnet, you will need to know that all of our packages except for the Value Package and the Mini Site include SSH (secure shell) For shell access, Instead of using a standard telnet program, you will need to use a program supporting SSH to log into your server. Contact sales for links to free SSH programs and instructions. FTP's main purpose is to make transferring files from one computer to another as fast and easy as possible. One of the best advantages of FTP over using your control panel to upload files, is that FTP programs allow you to upload or download many files at once. Unlike Telnet, FTP is not a program. It is instead a "protocol" just like http is a protocol. Your browser program uses the http (Hyper Text Transfer Protocol) for viewing, reading, and translating HTML into the bright and colorful interactive web pages you see on your computer screen. In order to use FTP you will need a program such as CuteFTP or WS-FTP for Windows, or Fetch for Macintosh users. Visually, if you are using CuteFTP or WS_FTP, you will see two panels, each with folders (also called directories) and files displayed similiar to Windows explorer. One panel will contain the folders and files on your computer. The other panel will contain the folders and files on the site you are logged into. If you are using Fetch, you will see something a bit different. Remember, we all start out not knowing anything about any of this, and it's not as difficult as it all seems in the beginning. The learning curve is actually easy, fun to ride, and well worth the effort! So what are you waiting for? Get Started Now! If you want to make a website but don't know how to design websites, let AllWebCo help you build a website using our website templates. Get website help and create your own website in no time. With a few easy steps you can get set up and start a website all by yourself. Take a look at our guide on how to build your website. In four easy steps we can get you online with a site of your own. Designing websites can be as complicated or simple as you make it. You can start from scratch, or you can use one of our many templates and make the appropriate changes. AllWebCo can get you started, whether you want a personal webpage, an online business website, or a complex Ecommerce website. AllWebCo can provide both the website hosting and guidance for creating a your ideal website. Once you have settled on the design for the new website and you're happy with your website creation, you can upload website through an FTP client or other means. You can also transfer website from other website hosts. AllWebCo provides 24/7 technical support, so you can feel confident that you can resolve any issues or have any questions answered quickly. Choose a web hosting package that best fits your site's needs. AllWebCo freely offers many advantages that other website hosts charge extra to provide. Enjoy unlimited parked domains, unlimited add-on domains, unlimited FTP access all day, and more disk space than what is provided by most hosting companies that use their policies to prevent them from having to provide you with the outrageous amounts of space they advertise to lure you into a contract you can't get out of. We have no contracts, and we provide all the tools you'll need to help your new website reach its full potential. AllWebCo takes pride in its customer service. If you want to build a website but don't have the slightest clue how to make a website, let AllWebCo make it simple for you, helping you design your website with our free website templates, powerful editors built into our cPanel control panels, and reliable tech support. AllWebCo is a Web Hosting company. Our main offerings include: Web Hosting Packages and Affordable Web Hosting for Personal Websites, Professional Business Web Hosting options, and Website Templates for creating your own website. If you need help starting a web site setup please check out our help page. This is a page dedicated to help with web site hosting, design templates and just generally getting your web site started. How can i set up a website? Starting a website is easy. Just follow our easy steps and you can have a web site up and running in no time at all. All the help setting up a website you need can be found at AllWebCo. How can I get a domain name? How can I make a website? This page guides you through all the steps needed when setting your web site up or starting a website. 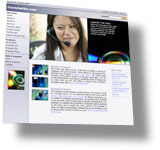 Hosting, domain names, getting new web pages using templates or professional design. AllWebCo is where can i get the most reliable web hosting without hassle. Our "Getting Started" page shows you step by step how you can get a web site up and running as quickly as possible. This page features help for small businesses and corporations. Getting your business on-line is easy and quick at AllWebCo. How can I get my web site on-line? Everything you need here in one place: Web site help, help starting a website, hosting help, domain name setup so you can get your website on-line as quickly as possible. Starting a website help and guide. AllWebCo gives you everything you need for starting a website. With our hosting packages you can setup your webpages without any hassle. If you are starting an internet site or getting an internet site on line then AllWebCo is your on stop hosting and design solution. starting a wepage? Professional web space for starting a web site. Quality space for webpages, internet space and starting your own website. If you're asking "how can i get my small business on line?" you will find the solution for starting a website at AllWebCo. If you need help starting a webpage or starting a website, AllWebCo provides an easy web site setup for starting a webpage. If you are starting a website check out Allwebco's hosting packages. Anyone starting a web site will ask "where can i get hosting? ", "how do i set up a website?" or "how can i start a webpage?" AllWebCo is a full service provider starting it easy for you to get you site on-line as fast as possible if you are starting a website. how can i set up webpages, check our helpful hosting page if you are starting a website. how can i make a web site on-line, AllWebCo meets all your internet needs!